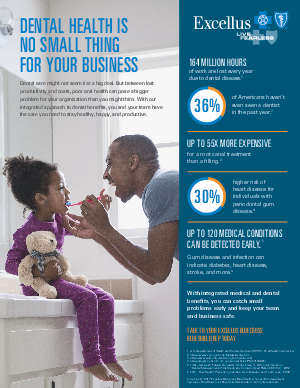 Home > Excellus BlueCross BlueShield > Dental health is no small thing for your business. A sore tooth can make it feel impossible to get anything done. And if you and your employees don’t have the right dental coverage, that sore tooth could be just the start of your problems. While dental benefits might not seem like a huge deal to most, the truth is they can have a big impact on your team’s productivity and your organization as a whole. That’s why Excellus BlueCross BlueShield provides integrated medical and dental benefits. So you can catch small problems before they become serious issues, keep costs under control, and be more proactive about employee wellness.